Dahlia -Small [dahlia] : Michigan Flower Farm, Locally Grown Flowers...Naturally! 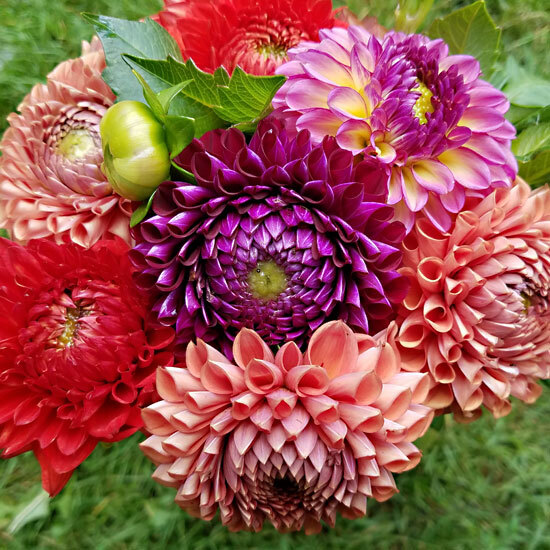 We are a grower of beautiful fresh, specialty cut, naturally grown flowers and bouquets for weddings, events, florists, floral designers, businesses and households in the Ann Arbor, Detroit, Northville, Novi, Plymouth, Salem and South Lyon, Michigan area. We do not ship fresh flowers. Fresh flowers are available for pick up only. Colors: Shades of Red, White, Pink, Purple, Lavender, Coral, Yellow, Orange in a variety of shapes. Notes: Lovely flowers in a variety of colors and colors. Late July - August through frost.